If you're in the process of getting divorced, you may want to do some serious thinking before you make the decision to sell your home. While it may seem like an easy way to relieve some of the stress that is relative to your divorce, it can also add other stress factors such as concerns over taking a loss on the house during current economic times. With homes currently selling for less than they were in previous years, you may take a serious loss in order to hurry up and sell the home to finalize the property settlement angle for your divorce. Before you make a decision that is as important and financially challenging as selling your home, it is a good idea to consult with a financial professional who knows not only the real estate market but divorce as well. This is not a field in which divorce lawyers can be of much help because they do not possess the expertise necessary to help you develop a plan and formulate the right strategy necessary to successfully sell your home in a way that will allow you to avoid mistakes that will cost you hundreds or even thousands of dollars in taxes. These experts will also be able to offer advice about other options you may not have considered—or even known about—when deciding to sell your home in a depressed real estate market. A divorce and real estate special can advice you on other options you may want to consider before making the decision to sell your property when the price of real estate might cause you to suffer a financial loss. 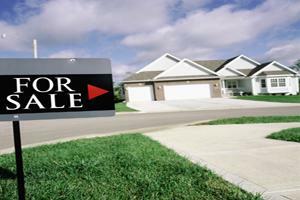 Accept less than fair market value of your home in order to sell it quicker. Hold out until you receive an offer that is reasonably close to the fair market value of your property thus running the risk of a long wait to sell your home. Unfortunately many people in the process of getting divorced allow their emotions to overtake common sense and attempt to make decisions that might not be financially sound. Seeking the advice of an expert will help you make the decision that is best for your individual situation. It is also important for couples in the process of a divorce to think about how much time and cost they will expend finding a new home and the effect this process might have on the sale of their home. When you become educated about the process of selling your home in a depressed real estate market, you will be in a better position to decide if it is a good idea to sell your home at the present time. If you make the decision to wait until the real estate market improves, you must make arrangements for paying your mortgage payments and other household expenses in the meantime. What you don't want to do is sell your home when the market is in a depressed state just to finalize your divorce but rather wait until the market improves and your emotional wounds from getting divorced have healed. The wait will allow you to make the right financial decision and prepare for the tax advantages of selling your home in a better market. What Is A Financial Background Check? What Is Better: A Prepaid Debit Card Or A Checking Account? What are the Benefits and Risks of Investing in Gold? Copyright (c) 2012 A Financial Journal. This Blogger theme is sponsored by Corporate Office, which has been featured on Herald Online, EIN Presswire and KTEN.